Jesus, when he was about to ascend into the heavens, he commanded us to go into the world and preach the good news. Some Christians have left their comfort zone to make sure the gospel reach the lost soul and where they are now, they are being persecuted. We can’t fight these persecutors physically but we can through prayer for persecuted Christians because we have a God that answers prayer. Ephesians 1:16 “I have not stopped giving thanks for you, remembering you in my prayers.” Paul an apostle that has faced a series of persecution still take it upon himself to pray for other Christians that are facing persecution. If we really care for the Christians in the world, the very first thing we should do as a Christian is to pray. Prayer is the key to all – when we try all our best without putting into God first in prayer, we might be doing without yielding a positive result. God has the heart of man in his hand (Proverbs 21:1), he has the heart of your friend in his hand. All we can do is just to pray for them, only God can heal and comfort them. God is the one that heals. Originally, the prayer for persecuted Christians is a prayer of encouragement in the Lord. It’s a prayer that is focused on you telling God to console them and be their strength. Persecutions can weaken one’s faith, it can make a Christian give up on Christ – if you don’t want that, why don’t you then always remember them in your prayers? Why should we pray for our persecuted brothers and sisters? To make the gospel go round. There are so many reasons why we should say a word of prayer for persecuted Christians every day. 1. To show that you care. Do you know that the only thing some of these persecuted Christians need is to see that someone cares, they don’t want to feel neglected. Praying for them is to show that you care and with this, they can carry on in the Christian journey. It should be one of your desire to help a friend out of crisis or send a word of peace through prayer to them and make them forget about the persecution they are facing and focus on Jesus Christ. 2. To make them overcome. Jesus didn’t give up on us but still pushing so that we might overcome by his power. Even though Jesus faced so many temptations, tribulations, and trials – he was so persistent in helping us. Don’t give up on the persecuted Christians, don’t forget them and behave as if they are not existing, do all it takes to go down on your knees and pray for the persecuted Christians in the world – the prayer you pray is not in vain, it will have a great impact and will change things for the better. James 5:16b “The prayer of a righteous person is powerful and effective.” Like someone said “When I take a path to help someone and it’s not working, I go down on my knees and pray. All I want is to help.” Kneeling down at the corner of your room to say a prayer for persecuted Christians works. 3. To make the gospel go round. Some people have dedicated their lives to preaching the gospel to all nations, we call them the missionaries. So many missionaries have been faced with death in some countries of the world. Even after all these, they are not going down, they want to go further but you are here, how do you partake in this mission work? The simple way is to constantly pray for them. Pray that God will preserve them and keep them safe, they need your prayers. Many people convert to be part of this God’s family because of the love they see in us – they believe you will be there and you will always remember them if they are faced with trials, they trusted God in you. Don’t let this stop, keep showing love because God is love. I John 4:8. Let’s say prayer for persecuted Christians in the world, for our brothers and sisters in Christ. Heavenly Father, I thank you for the love you have shown us by sending your son to die for our sins so we can be called your son. 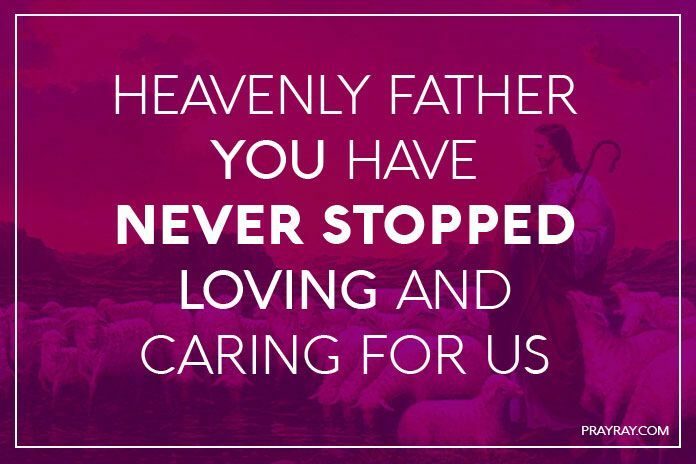 For once you have never stopped loving and caring for us. You have promised that you will be there for us all through trials and temptations, you said you have overcome the world for us, thank you, Lord. I pray for the Christians of the world, your children that are going through hard times, those that are faced with persecution, that you will fill their heart with joy and they will find peace in you. Amen.